JDC - Archives : Portrait of 13 month old Hanna Silberberg lying in her crib with her toy dog at the Rothschild Hospice. Title Portrait of 13 month old Hanna Silberberg lying in her crib with her toy dog at the Rothschild Hospice. 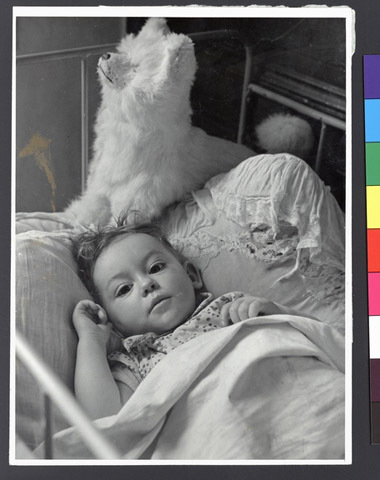 Description A portrait of 13 month old Hanna Silberberg lying in her crib with her toy dog in the Rothschild Hospice, a facility run by JDC as an infant and maternity center for transients and Jewish refugees. JDC converted the entire building to be able to provide for these refugees. The institution is being administered by the COJASOR, a French Jewish welfare organization subvented by JDC.